Growing your business as big as you can isn’t always a good thing. Not if it’s the wrong kind of growth. 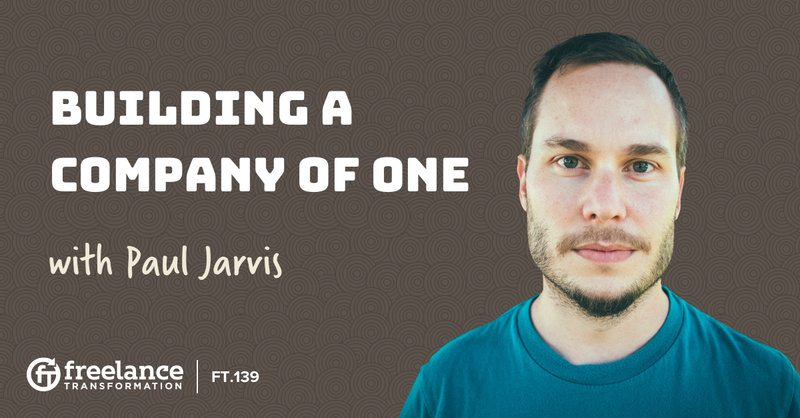 Paul Jarvis, who helps people build better (not bigger) businesses, talks about why he never grew his business in the way you’d expect. His new book, “Company of One”, breaks down the how and why it can actually be beneficial to run your business as lean as possible. Today's episode is brought to you by Harpoon! Harpoon is the all-in-one financial management solution built specifically for freelancers like yourself. Harpoon is the first online invoicing and time tracking tool, at least that we've seen, that helps you actively predict if your freelance finances are on track to meet your goals, instead of just reporting them in hindsight. Try Harpoon completely risk-free for 14 days. And if you love it use the coupon code TRANSFORMATION to receive 20% off the first 3 months of your subscription! Paul questions the stereotypical views of business growth and challenges freelancers to think outside of the box. Working for yourself really does mean you’re responsible for everything, but you can divvy that responsibility up however you want. Paul’s trick to working for himself is always doing the things he loves while avoiding the tasks he doesn’t. Paul has been freelancing since the late ‘90s. He started in web design. Building websites for fun caught the attention of a few big companies, and with them, he learned that management wasn’t necessarily his strongest attribute. But he also learned how much he loved working with clients. He took this client list and jumped headfirst into freelancing, choosing only to do the kind of work he loved for his favorite clients. Today, Paul is breaking the mold by never working a typical day. He knows that the corporate lifestyle doesn’t fit his expectations, so he built himself a freelance career that fits the kind of life he wants to live. Whether he’s coding websites, running his software companies online, or communicating with his students, it’s all on his terms. Every business is a lifestyle business, I’ve just really leaned on the lifestyle part. I’ve built work around what I like to do with my life. Not all freelancers need to become like Silicon Valley startups to succeed. There is no rule that states you have to start hiring people after you make a certain amount of money. As a freelancer, you have the power to create the lifestyle you want with your business. If you want to work on your terms without hiring a whole team of project managers and assistants, Paul says that’s the most responsible decision you can make. Knowing what you want out of your business is the first step in defining the path of growth your business will take. A lot of freelancers mistakenly assume that they have to go big or go home, but Paul likes to think smaller. His idea for building a business that’s too small to fail uniquely applies to freelancers because there is no corporate structure in that line of work. Freelancers are their own managers. There is no corporate boss, but there are clients with needs and deadlines. That kind of work changes the game and gives freelancers and entrepreneurs the chance to grow their business based on those unique needs. People have exit strategies instead of exist strategies. I would rather exist in my business than plan an exit from it. Paul talks about the other ways he grows his business to meet the evolving needs of his clients without losing himself in the process. He made the hard decision not to hire out, and his technique for committing to his company of one concept meant he had to find other paths for growth. Teaming up with friends and clients in a partnership is one way to build a business, but niching down brings Paul the most success. The more I niche down, the more I became known as an expert…the more I could grow my business without growing my business. But how does someone grow their business without actually growing it? Within his niche, Paul is able to use his expertise to raise his rates and upgrade his client list. His set of skills sets him apart from other freelancers and makes it possible for him to earn more money doing the things he loves to do. Paul also recommends working toward a product-based business that emphasizes your skills, and the techniques he discusses today will change the way you look at your business’s growth. Being a freelancer doesn’t automatically mean you know how to run a business. A lot of freelancers get started because they’re good at one specific thing, but your talents are only a small part of what it really means to work for yourself. Paul has tips for niching down and communicating correctly so you can establish yourself as an expert and attract the right kind of client. With freelancing, you have to be okay with doing all of the work and wearing all of the hats, and being willing to learn. When you’re working for yourself, you’re looking for that perfect client. So you need to project the kind of reputation that will attract the clients you’re looking for. Break down the corporate ways of thinking and start thinking about the way you would like to work with someone. There are right and wrong questions to ask your client, and Paul breaks down the communication barriers that often plague new freelancers. Don’t approach your freelance career blindly. Only chase after the growth that you know you like. Don’t do something just because you think you should be doing it. Those people aren’t running a business. You are. And it’s important to remember where you stand in your business so you can continue to give high-quality work and grow in the direction you truly want.